Seasons Results. (where there are blanks - no record in ledger). Singles Knockout winner - Glenn Kilpatrick. Singles Knockout runner up - Brian Harland. Doubles Knockout winners - Brian Harland & Dan McCarthy. Heaviest Fish in a competition - George Middlemas - 11 lb 09½ oz (16th January 2008). 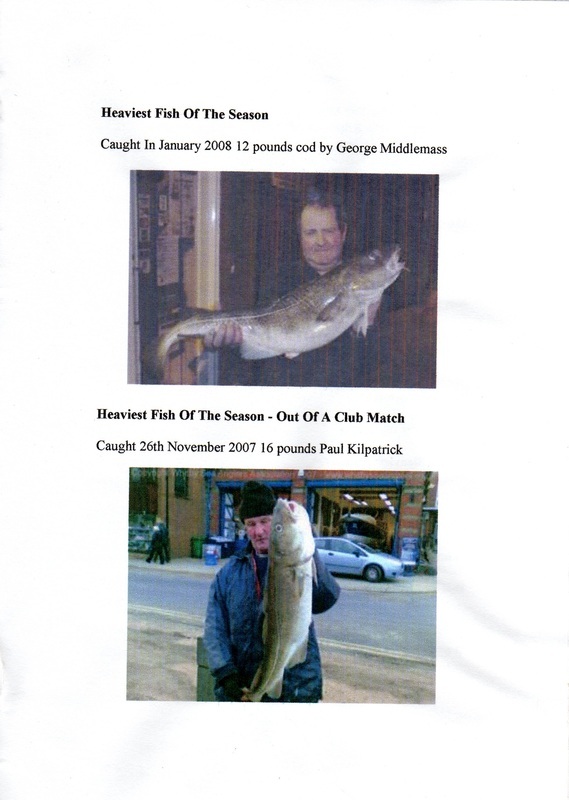 Heaviest Fish out of competition - Paul Kilpatrick - 16 lb 00 oz - 26th November 2007. Christmas match winner - Denis Thompson - 0 lb 12 oz (no error!!). Christmas match Heaviest Fish - Andrew Cass - 0 lb 10 oz (no error!!). Greatest number of fish - Glenn Kilpatrick - 109 fish. Heaviest Bag of Fish - Brian Harland - 40 lb 07 oz - 7 fish (wednesday 14th November 2007). 1st - Ryan Vasey - 27 lb 04 oz - 17 fish. Junior Heaviest Bag - Ryan Vasey - 6 lb 10 oz - 2 fish (11th November 2007). 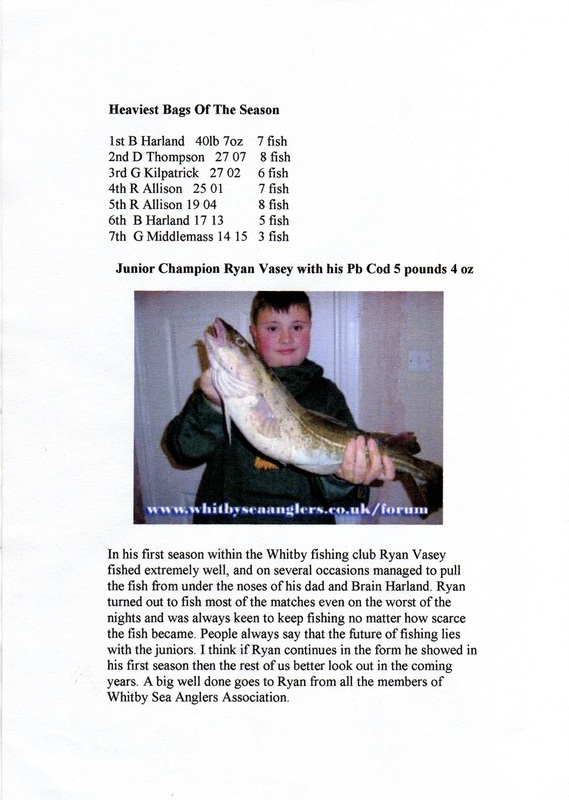 Junior Heaviest Fish - Ryan Vasey - 5 lb 04 oz (16th January 2008). Total Number of fish - 872*. *All figures re-entered into an Excel spreadsheet 28/04/2014. 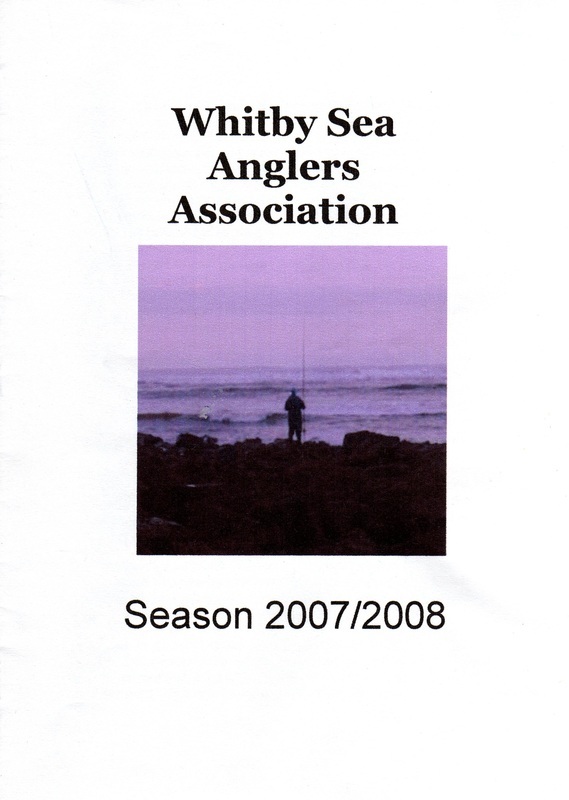 Another season for Whitby Sea Anglers Association kicked off on the 26th September 2007. The lads who turned out for this match were met by driving rain and gale forced northerly winds, in fact in terms of weather this night was probably one of the worst fishing nights of the whole season. The fishing was non to clever too with the fish not yet in winter feeding mode catches were a little slow. Glenn Kilpatrick started the season in the manner he had finished the last, winning this match with a single codling of 6 lb 12 oz. The clubs newest junior Ryan Vasey marked his fishing debut with a rockling of 11 oz. Ryan did what he managed to do on many occasions throughout the season - beating his dad and many of the clubs other senior members who failed to catch. As the days shortened in October William Atkinson, Andrew Cass, Brian Harland, Dave Perrett & Phil Mead all fished well individual match wins. The heaviest bag of the month belonged to Glenn Kilpatrick with a mixed bag of billet and pollack for 13 lb 02 oz. Brian Harland landed the heaviest fish of the month, a fine cod of 5 lb 07 oz. 22 members entered and 7 weighed in 14 fish for 42 lb 04 oz. Overall winner was Davey Turnbull. November belonged to Brian Harland who smashed the clubs 3 hr match record with 7 fish for 40 lb 07 oz caught on the 14th of the month. Club members looked on with envy at the scales as Brian removed 7 good codlings from his bag at the weigh in, the biggest also being the heaviest fish of the month at 8 lb 15 oz. Brian later explained that the night could have been even better as 2 bigger fish snapped his main line whilst he was winding them in. This tremendous catch from Brian meant he now had in excess of a 50 lb lead on the chasing pack and those behind were wondering how they could possibly keep pace with Brian who was in scintillating form. Three other anglers also had big bags in November, but nothing to compare with Brain’s haul. Denis Thompson had the second heaviest bag of the season with 8 fish for 27 lb 07 oz, Glenn Kilpatrick took the third heaviest bag with 6 fish for 27 lb 02 oz. Rob Allison also managed 7 fish for 25 lb 01 oz. On the 11th November junior member Ryan Vasey out fished his dad Mike and most of the senior club members when he returned to the scales with his new personal best fish, the heaviest codling of the night, weighing 5 lb 04 oz. Monday the 26th November also saw something very special with veteran angler Paul Kilpatrick showing his class with an excellent catch whilst pleasure fishing on the west pier - a huge cod of 16 lb exactly (more to come on this one later). James Gilpin and Ben Laws also managed match wins this month showing that on their day they are capable of beating the rest. Members club results. 5 fish for 17 lb 03 oz. 18 members entered and only 6 weighed in with what can only be described as the worst 'weigh-in' in history! 6 fish for 3 lb 07 oz. Total weighed-in 631 fish for 1,134 lb 05 oz - average fish weight 1 b 13 oz. December which is so often the best month of the season really failed to live up to expectations. Long calm periods, meant the fishing was often tough. Andrew Cass had the best night of the month and continues to be one of the clubs most improved anglers. Andrew found 3 good cod for just short of 16 lb on a rather stormy and difficult night when many club anglers failed to catch at all. Paul Kilpatrick continued to catch the better fish of the month with a cod of 7 lb. 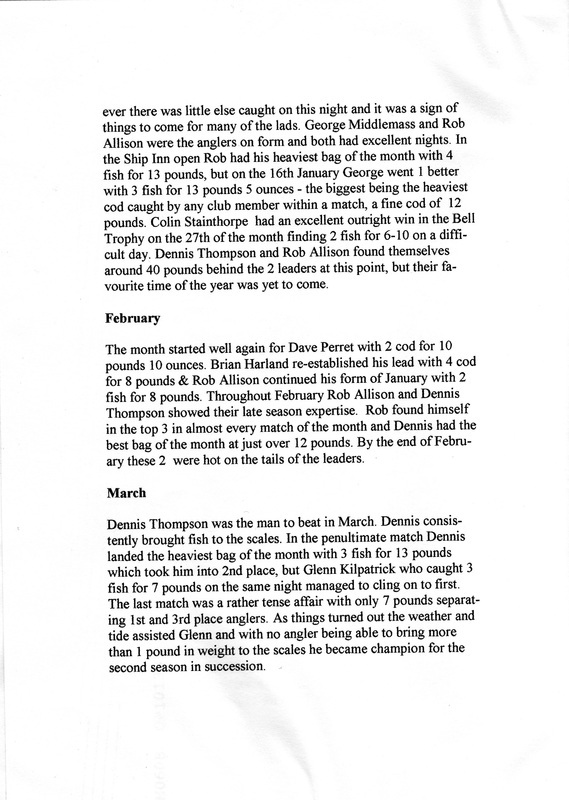 William Atkinson and Dave Perrett had match wins as did Glenn Kilpatrick who was fishing consistently well. With catches of cod and whiting throughout December Glenn had narrowed the gap between first and second to 12 lb by Christmas. 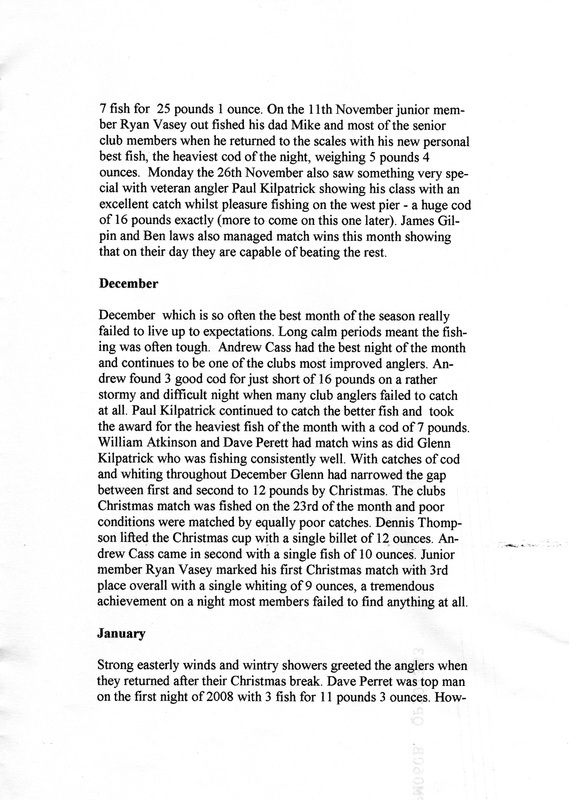 The clubs Christmas Match was fished on 23rd of the month and poor conditions were matched by equally catches. Denis Thompson lifted the Christmas Cup with a single billet of 12 oz. Andrew Cass came in second with a single fish of 10 oz. Junior member Ryan Vasey marked his first Christmas Match with 3rd place overall with a single whiting of 9 oz, a tremendous achievement on a night most members failed to find anything at all. 16 members entered and 8 members weighed in. Members club results. 20 fish for 56 lb 09 oz. Overall winner was Paul Medd. The annual Ship Inn Open match was fished on Sunday 13th January. With a growing south easterly swell and heavily coloured water hopes were high for some good fish. 67 anglers entered the event and there were some good catches with 4 double figure bags of cod and 1 double figure fish being brought to the scales. Top man on the day was well known local match angler Paul Medd from Scarborough who caught a single fish of exactly 10 pounds in weight. Second was Norman Brittain from Whitby with a cod of 7 pounds 15 ounces. In third place was Simon Barker from Scarborough with another good cod of 7 pounds 4 ounces. ​The sweep for the heaviest bag of codlings was won by Whitby club member Rob Allison who had 4 fish for 13 pounds 15 ounces, the prize for the second heaviest bag also went to a Whitby club member Dennis Thompson with 6 fish for 13 pounds. 12 members entered and 8 weighed in. Strong easterly winds and wintry showers greeted the anglers when they returned after their Christmas break. Dave Perrett was top man on the first night of 2008 with 3 fish for 11 lb 03 oz. However there was little else caught on this night and it was a sign of things to come for many of the lads. George Middlemas and Rob Allison were anglers on form and both had excellent nights. In the Ship Inn Open Rob had his heaviest bag of the month with 4 fish for 13 lb 05 oz - the biggest being the heaviest cod caught by any club member within a match, a fine cod of 12 lb. Colin Stainthorpe had an excellent outright win in the Bell Trophy on the 27th of the month finding 2 fish for 6 lb 10 oz on a difficult day. Denis Thompson and Rob Allison found themselves around 40 lb behind the 2 leaders at this point, but their favourite time of the year was yet to come. Total weighed-in 822 fish for 1,474 lb 01 oz - average fish 1 lb 13 oz. The month started well again for Dave Perrett with 2 cod for 10 lb 10 oz. 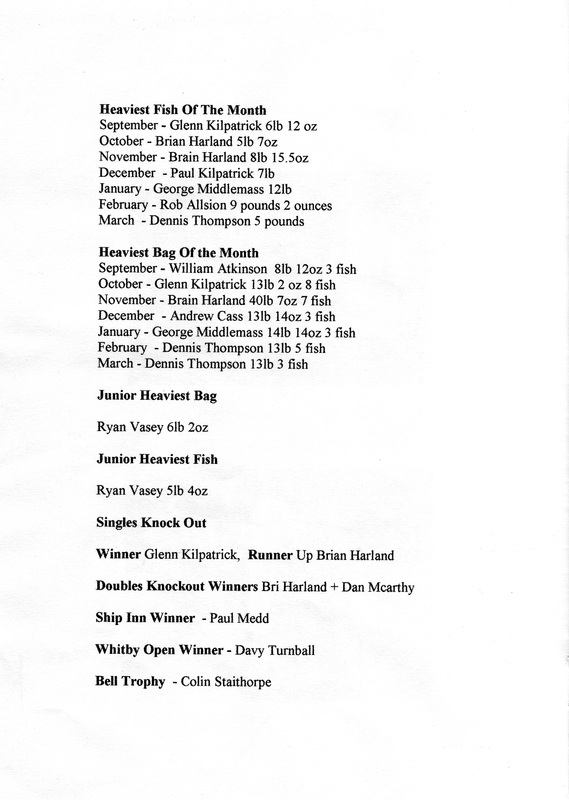 Brian Harland re-established his lead with 4 cod for 8 lb & Rob Allison continued his form of January with 2 fish for 8 lb. Throughout February Rob Allison and Denis Thompson showed their late season expertise. Rob found himself in the top 3 in almost every match of the month and Denis had the best bag of the month at just over 12 lb. By the end of February these 2 were hot on the tails of the leaders. Leader board after 52 matches - all figures re-entered into an Excel spreadsheet & double checked - 28th May 2014. Total weighed-in 872 fish for 1,591 lb 01 oz - average 1 lb 13 oz. Denis Thompson was the man to beat in March. Denis consistently brought fish to the scales. In the penultimate match Denis landed the heaviest bag of the month with 3 fish for 13 lb which took him into 2nd place, but Glen Kilpatrick who caught 3 fish for 7 lb on the same night managed to cling on to first. The last match was a rather tense affair with only 7 lb separating 1st and 3rd place anglers. As things turned out the weather and tide assisted Glenn and with no angler being able to ring home more than 1 lb in weight to the scales he became champion for the second time in succession. 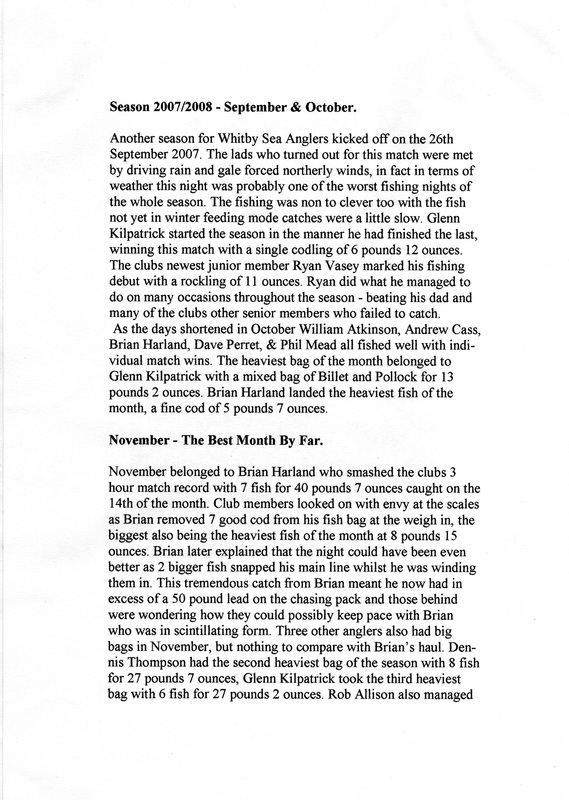 D Thompson - 13 lb 01 oz - 3 fish..
Another season for Whitby Sea Anglers Association kicked off on the 26th September 2007. The lads who turned out for this match were met by driving rain and gale forced northerly winds, in fact in terms of weather this night was probably one of the worst fishing nights of the whole season. The fishing was non to clever too with the fish not yet in winter feeding mode catches were a little slow. Glenn Kilpatrick started the season in the manner he had finished the last, winning this match with a single codling of 6 lb 12 oz. The clubs newest junior Ryan Vasey marked his fishing debut with a rockling of 11 oz. Ryan did what he managed to do on many occasions throughout the season - beating his dad and many of the clubs other senior members who failed to catch. As the days shortened in October William Atkinson, Andrew Cass, Brian Harland, Dave Perrett & Phil Mead all fished well individual match wins. The heaviest bag of the month belonged to Glen Kilpatrick with a mixed bag of billet and pollack for 13 lb 02 oz. Brian Harland landed the heaviest fish of the month, a fine cod of 5 lb 07 oz. November belonged to Brian Harland who smashed the clubs 3 hr match record with 7 fish for 40 lb 07 oz caught on the 14th of the month. Club members looked on with envy at the scales as Brian removed 7 good codlings from his bag at the weigh in, the biggest also being the heaviest fish of the month at 8 lb 15 oz. Brian later explained that the night could have been even better as 2 bigger fish snapped his main line whilst he was winding them in. This tremendous catch from Brian meant he now had in excess of a 50 lb lead on the chasing pack and those behind were wondering how they could possibly keep pace with Brian who was in scintillating form. Three other anglers also had big bags in November, but nothing to compare with Brain’s haul. Denis Thompson had the second heaviest bag of the season with 8 fish for 27 lb 07 oz, Glen Kilpatrick took the third heaviest bag with 6 fish for 27 lb 02 oz. Rob Allison also managed 7 fish for 25 lb 01 oz. On the 11th November junior member Ryan Vasey out fished his dad Mike and most of the senior club members when he returned to the scales with his new personal best fish, the heaviest codling of the night, weighing 5 lb 04 oz. Monday the 26th November also saw something very special with veteran angler Paul Kilpatrick showing his class with an excellent catch whilst pleasure fishing on the west pier - a huge cod of 16 lb exactly (more to come on this one later). James Gilpin and Ben Laws also managed match wins this month showing that on their day they are capable of beating the rest. December which is so often the best month of the season really failed to live up to expectations. Long calm periods, meant the fishing was often tough. Andrew Cass had the best night of the month and continues to be one of the clubs most improved anglers. Andrew found 3 good cod for just short of 16 lb on a rather stormy and difficult night when many club anglers failed to catch at all. Paul Kilpatrick continued to catch the better fish of the month with a cod of 7 lb. 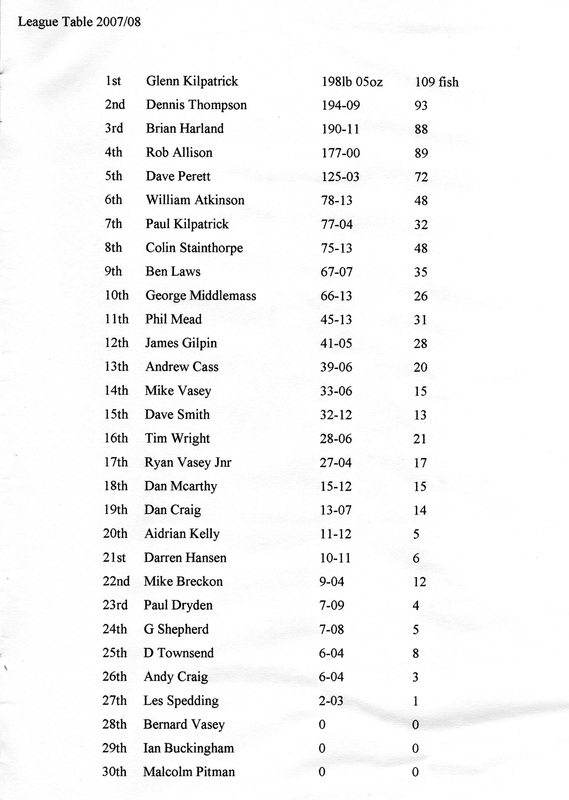 William Atkinson and Dave Perrett had match wins as did Glen Kilpatrick who was fishing consistently well. With catches of cod and whiting throughout December Glenn had narrowed the gap between first and second to 12 lb by Christmas. The clubs Christmas Match was fished on 23rd of the month and poor conditions were matched by equally catches. Denis Thompson lifted the Christmas Cup with a single billet of 12 oz. Andrew Cass came in second with a single fish of 10 oz. Junior member Ryan Vasey marked his first Christmas Match with 3rd place overall with a single whiting of 9 oz, a tremendous achievement on a night most members failed to find anything at all.